An old cemetery tells a story. It tells of the founding families in a community, a child coddled by her mother for only a few months, a young husband whose wife died in childbirth and was left to raise an infant, a young person taken by a disease that could be treated today and another who despite all lived to ripe old age. It also tells us the story about who we are, where we come from and about those who sacrificed to make a better life for their children. Just standing on this sacred ground by the beautiful river made me want to know their stories. The cemetery sign says in the pioneers’ mother tongue of Gaelic, “Cuimhnich air na daoine bho’n d’thanaig thu which translates to “Never forget those you come from”. This Pioneer Cemetery was the original Baptist Cemetery in Clyde River which was located on the river just down from the location of the original Baptist Church, now the Livingston property. When it was decided to build the new church beside Clyde River School (currently Riverview Community Centre), the old church building was used for the community hall and later removed. It is now located on the property of Brian MacPhee on the Bannockburn Road. The following are the family stones in the Pioneer Cemetery. We have transcribed the inscriptions. Most of the names, dates and epitaphs were legible, and with the help of Island Register, Canadian Historic Places and History and Stories of Clyde River, more information could be added. Also, Eric MacPhail had developed a scrapbook featuring notes and photos which meticulously details the restoration of the cemetery in 1995, the Clyde River Cemetery Restoration Service on September 1, 1996, along with background information on how the people buried in the Pioneer Cemetery are connected to the people we know in Clyde River. The following names appear in alphabetical order. If any of you have further information than appears here, we invite you to make notes in the comments section and we will update the story. 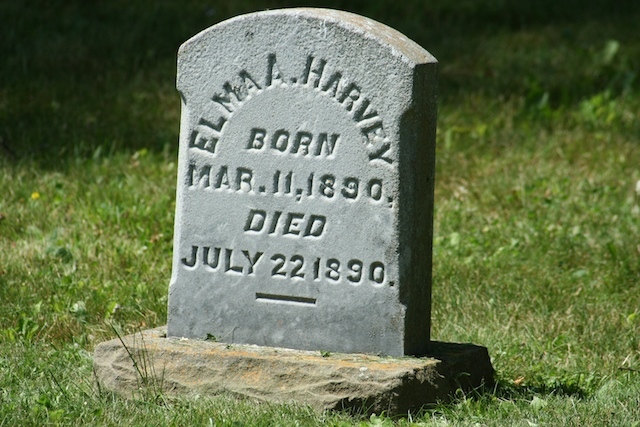 Elma was the infant daughter of Sarah Ann McLean and Elmer Harvey. Sarah Ann was the daughter of Allan McLean. Their other children were Laura and Evangeline (Jean). Harvey McLean was named after Jean Harvey at her request. Elmer Harvey built the home where C.D. McLean later lived. C.D. was the half sister of Sarah MacLean. 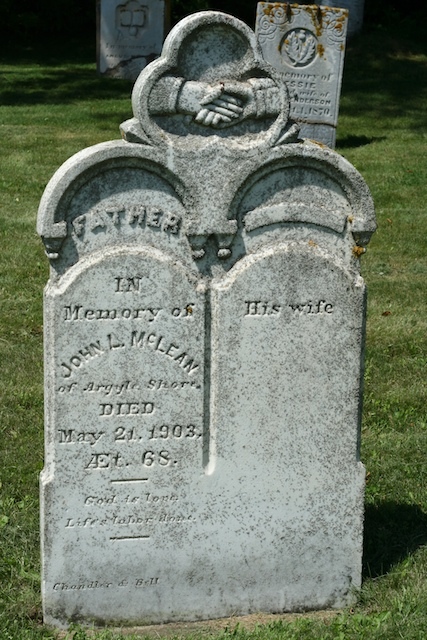 Sarah McLean’s brother John Duff McLean (1853-1926) married Euphemia MacQuarrie (1849-1926). This is how the McLeans are related to the McQuarries in Clyde River. Sarah and John Duff’s mother was Catherine Duff (1826-1869), Allan McLean’s first wife. During this time, stones often featured the woman’s maiden name and then her husband’s name. 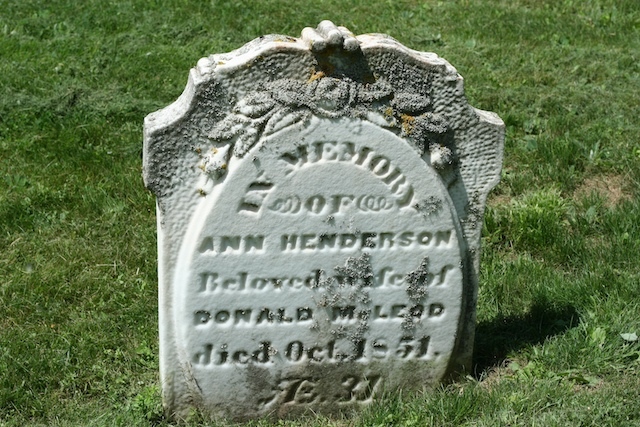 There is no confirmed information about Ann, but she could have been the sister of John Henderson. 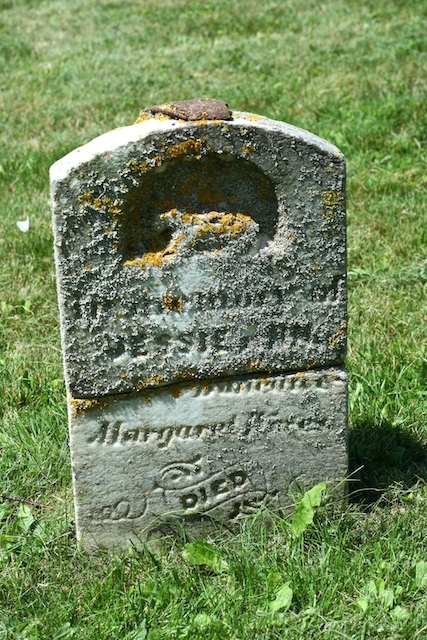 Editor’s note: Carved roses often appear on a woman’s stone. A rose bud, which this appears to be, represents a life not fully lived. Jessie was a MacEachern from Lot 48 (Mermaid area). Jessie and John’s children were Ewen, Archie, Annabelle (married John Murray) – named a daughter Jessie, Mary (married William Ward) and Margaret (married John Ladner). John was Baptist and Jessie was Presbyterian. The sons were raised Presbyterian, but the daughters were Baptist. Annabelle married John Murray, the grandparents of Lloyd Murray, Everett Murray and Hilda Beer – their father was Wallace Murray. Annabelle is the author of the Murray diaries from 1911-1925 which are part of the Clyde River museum collection. She is buried in the Baptist Church Cemetery. Her sister Mary married William Ward, Davis Ward’s grandfather (Davis’ parents were Benjamin Ward and Hattie (Beer) – Wards lived in Upper Bannockburn Road in Hampshire). Margaret (1839-1928) married John Ladner (1834-1908), the grandfather of Ernest Ladner (1912-1987) who married Beulah MacPhail. John Ladner’s grandfather, also named John, ran a sawmill on the Bannockburn Road. Hilda Beer always said they were connected to the Ladners and now we know that the connection was through the Hendersons. 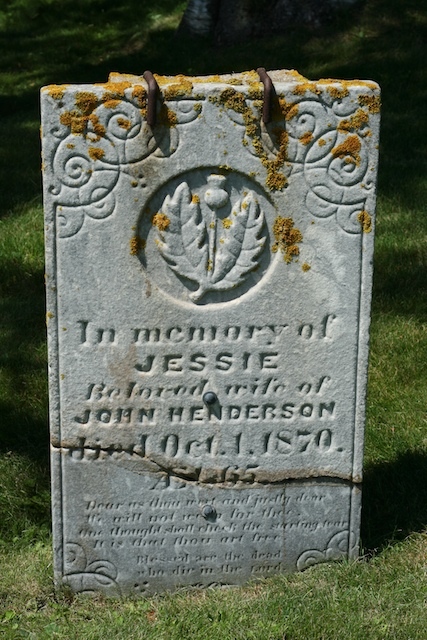 Jessie (MacEachern) Henderson would be the Great x2 Grandmother of Fred Beer, Donna Beer Green, Donald Murray, Byron Murray and Joan Murray Smith. Editor’s note: Carving of a thistle would be a symbol of Scotland. Could wish thee back again. Reverend Thomas Dale (1797-1870) – poet and theologian. Written in 1818. According to the Livingston’s of Clyde River, Lot 31, on Island Register website, Malcolm and Elizabeth (McPhail) had 5 children: Son who died at 3 years, Barbara Ellen, Donald, Annie and Mary. Malcolm was born coming across on The Rambler in 1806. His parents were Donald and Flora (MacPhail) Livingston. He was their first child and named after her father Malcolm McPhail. He married Elizabeth in 1837. 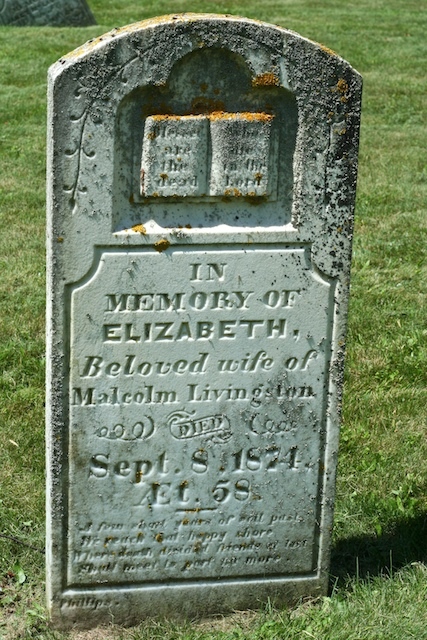 Malcolm died in Charlottetown in 1888 at 82 years old. No record of who Elizabeth’s parents were but indicates she was born on Baltic Road farm. We think she may have been some relation to Angus McPhail who owned Ardmore Farm on Bannockburn Road which is now owned by the Beer Family. The McPhails came from Aros, Isle of Mull. The main road through the village is Ardmor. Editor’s note: Carver’s name features on bottom left. Bible featured in carving represents wisdom. Ivy symbolizes friendship and immortality. to whom no hope is giv’n? and calls the soul to heav’n. the heav’ns and earth shall rend. beyond the reach of woe. shall meet, to part no more. This stone was erected in the late 1980s by Nelson MacLaughlin, then MLA in the Province of Alberta, son of John and Ophelia MacLaughlin. Ophelia was sister of Charles D. MacLean. His sister was Helen (MacLaughlin) Black who also lived in Western Canada. Janet and Alexander were the parents of Duncan Wares who married Margaret Murray. Wares did not continue to be a common name in Clyde River, and it is believed they moved to Green Bay, PEI. Janet and Alexander Wares children were Alexander, George (Buried in Burnside cemetery), John, Livina (Buried in Burnside cemetery), Jessie Ann and Ettie Blanche. Charles was an original settler of a Meadowbank property, later owned by Harvey and Jean MacLean. Paternal lineage – Charles, then Allan, Charles D., Gordon, Harvey, Allen and then Kenneth. Charles McLean’s daughter Mary married to Archie MacQuarrie. Another daughter Ann married to James Cann who owned 26 acres on Bannockburn Road which is now part of the Beer farm. Editor’s note: Lamb symbolizes Christ, Redeemer. No known information. It is assumed that his wife ensured that there were details about her husband on the stone, having pre-deceased her. It appears that there was no one left to ensure her details were added. Editor’s note: Carver is Chandler & Bell. Shaking of hands symbolizes farewell to earthly existence. The hand on the left is the one of the deceased and the hand on the right is the Almighty welcoming the person into heaven. The shamrock shape represents the Trinity. 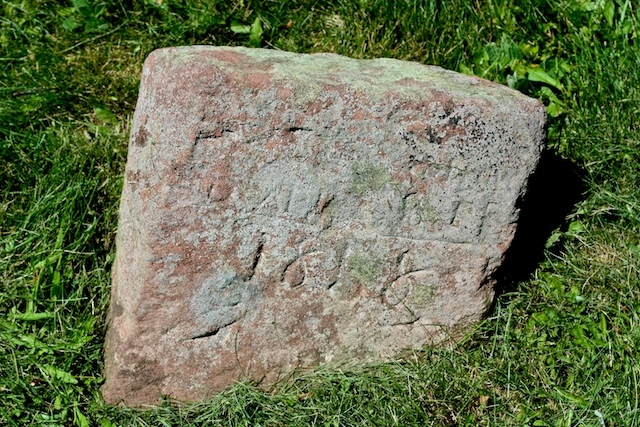 This is a sandstone marker that was too fragile to maintain legible engraving. There is no known information about this person. When our ancestors were immigrating to Prince Edward Island, they would have had strong gaelic accents and fear of uniformed immigration officers. There is some speculation that Morrow and Murray could have been one and the same family name. 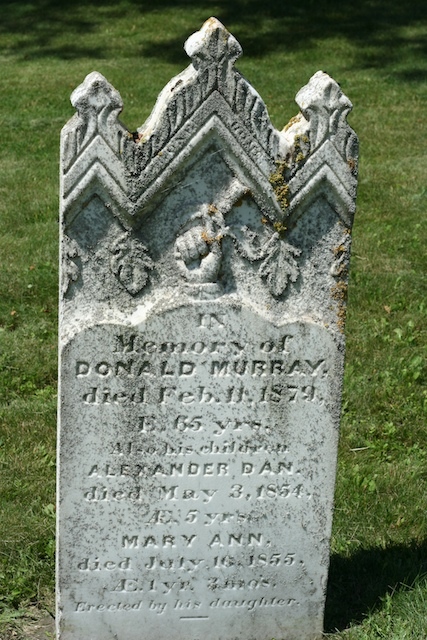 It could be the older or temporary stone for Angus Murray that was later replaced and appears in the next entry as the death dates are the same. In general reference material, we found that sometimes when they were digging a grave, they would take the largest stone found and carve it with the name of the deceased until such time they would have the permanent stone carved. This could be the case if it was an unexpected death. 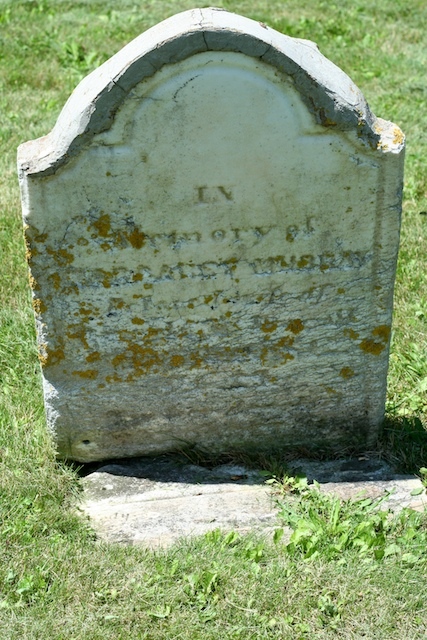 In memory of Angus Murray, born in 1808 and died April 6, 1858 at 49 by drowning after his horse went through the ice. Angus Murray was the first son of John Murray and Mary McPhail. He was born the year they migrated from Scotland and possibly born at sea on the way over. His siblings are Catherine, Mary, Margaret, Donald, Alexander, John, Duncan and Mary. He married Isabella MacPhail and their children were Anne, Archibald John, Margaret, Benjamin, Donald, Flora, Angus, Jane, and Alexander. Editor’s note: Bible symbolizes wisdom and includes carving of finger pointing to heaven. She was the wife of Donald Murray and their son John Alexander Murray (1842-1903) married Annabelle Henderson writer of the Murray Diaries that are in the Clyde River museum collection. Other children were Mary (1838-1853), Margaret (1848-1987) – married Duncan Wares, Alexander Daniel (1848-1853), Sarah Jane (1852-1930) – married Angus Charles McLean (buried in Burnside Cemetery) and parents of Heber McLean, and Mary Ann (1854-1855). Anne is the great-grandmother of Lloyd Murray, Everett Murray and Hilda Beer. Anne was formerly Anne MacKinnon, Aunt of Neil MacKinnon who was the grandfather of Reggie MacKinnon. 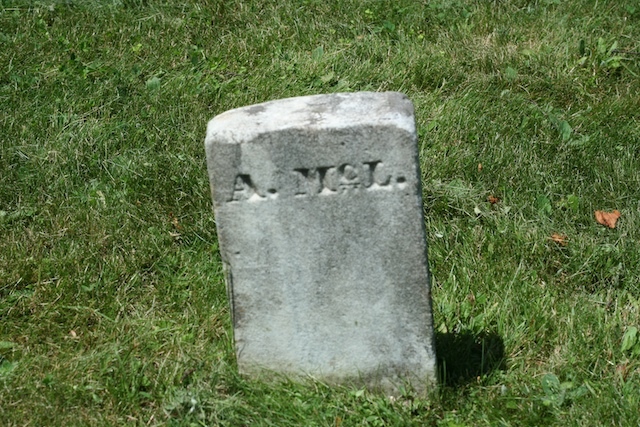 The new Baptist Cemetery had already been established, but it was Anne’s wish to be buried here with her husband and two of her young children. Anne would be the Great x2 Grandmother of Fred Beer, Donna Beer Green, Donald Murray, Byron Murray and Joan Murray Smith. Editor’s note: Carved roses are often featured on a woman’s stone. Symbolizes love, beauty, hope and unfailing love. A full rose signifies someone who has had a full live which she did. Carver’s signature in bottom left corner. 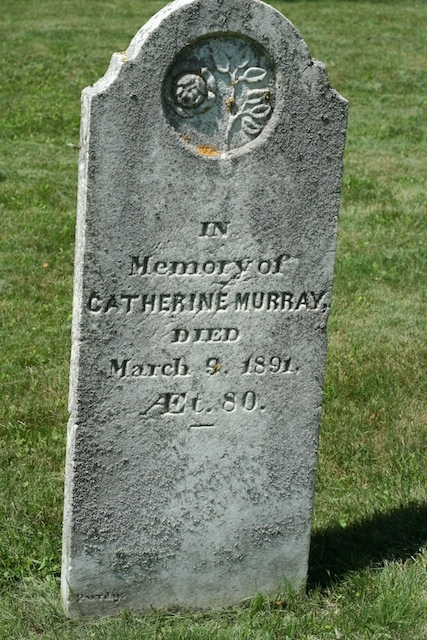 Catherine was born in 1810, the first daughter of John Murray and Mary McPhail. She didn’t marry and lived with her sister Mary (John) MacLaughlin. He other siblings were Margaret, Donald, Alexander, John, Duncan and Mary. Editor’s note: Carved roses are often featured on a woman’s stone. Symbolizes love, beauty, hope and unfailing love. A full rose signifies someone who has had a full live. If the rose is separated from the stem, it represents their separation from us. Mary Ann, born April 1854 and died July 16, 1855, age 1 year, 3 mos. Donald was the husband of Anne Murray. The children of John and Anne also included Mary (1838-1853), John Murray (1842-1903) – married Annabelle Henderson; Margaret (1848-1887) – married Duncan Wares, Sarah (Murray) McLean (1852-1930), mother of Heber McLean. Donald is the Great x2 Grandfather of Fred Beer, Donna Green Beer, Donald Murray, Byron Murray and Joan Murray Smith. Editor’s note: The carving features a hand pointing to heaven. Symbolizes a blessing from God. Oak leaves are a symbol of strength, honour, steadfastness and immortality. Fleur de lis represents life or the Trinity. She was the 5th child of Margaret and Duncan and was born on April 6th and died on the 17th. 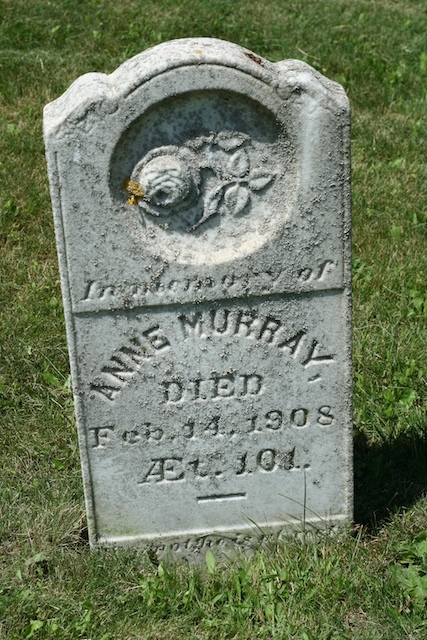 She is the granddaughter of Donald and Anne (McKinnon) Murray. Margaret’s sister Annabelle named their daughter Jessie. 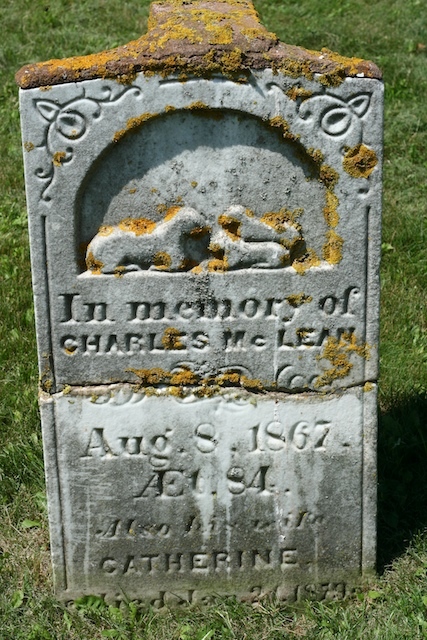 Editor’s note: Lamb symbolizes innocence and can mark the grave of a child. These are the Murray’s of the Baltic Road. John Murray was born in Scotland in 1777. 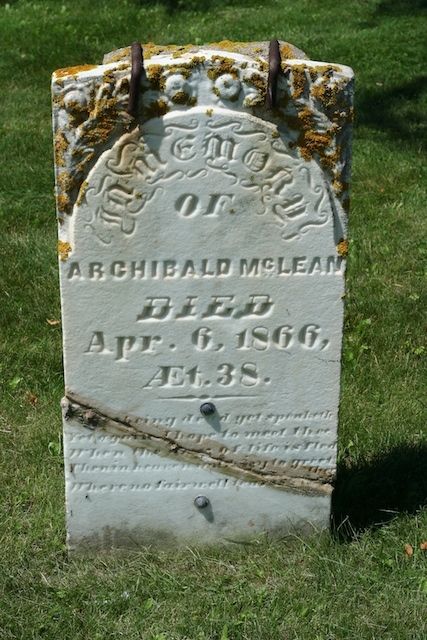 He came to Dog River in 1808 with wife Mary McPhail, daughter of Malcolm McPhail. Appears on 1863 Lake Map as J. Murray on West Dog River Road. Their children are Angus (also buried in Pioneer Cemetery), Catherine (also buried in Pioneer Cemetery), Mary, Margaret (also buried in Pioneer Cemetery), Donald (also buried in Pioneer Cemetery), Alexander, John, Duncan (also buried in Pioneer Cemetery), and Mary. John and Mary are the Great x3 grandparents of Fred Beer, Donna Green Beer, Donald Murray, Byron Murray and Joan Murray Smith. Editor’s note: Appears to have a shamrock carved with hand pointing to bible and heaven. Shamrock represents Irish heritage and/or the Trinity. Margaret was born in 1812 in Clyde River and she is the daughter of John and Mary Murray. 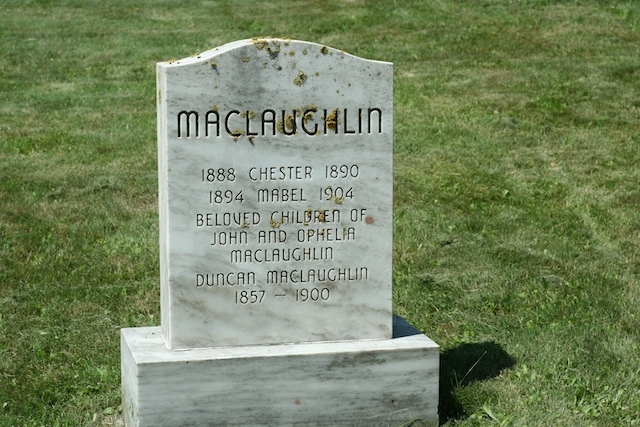 If you study the dates, it appears that her husband Dougall MacDougall lost his wife in childbirth and was left to raise an infant (named after her mother) and a three-year old, only to lose both his dear daughters as young adults. 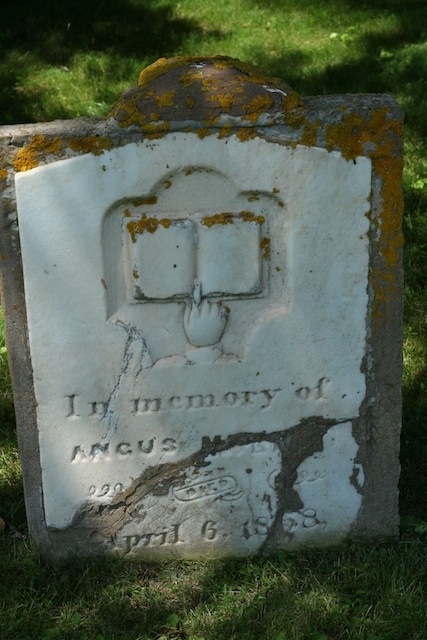 Margaret’s siblings were Angus (also buried in Pioneer Cemetery), Catherine (also buried in Pioneer Cemetery), Mary (also buried in Pioneer Cemetery), Donald (also buried in Pioneer Cemetery), Alexander, John, Duncan (also buried in Pioneer Cemetery) and Mary. 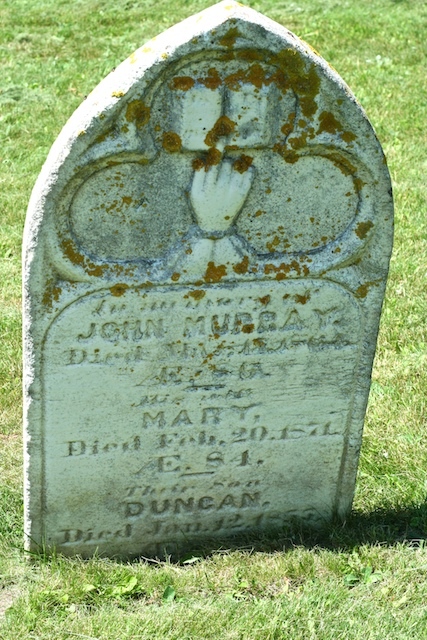 Her parents were John and Isabella Murray, daughter of Archibald Murray. Their children were Ann, baby daughter, Margaret J, Catherine, John A., and Duncan. 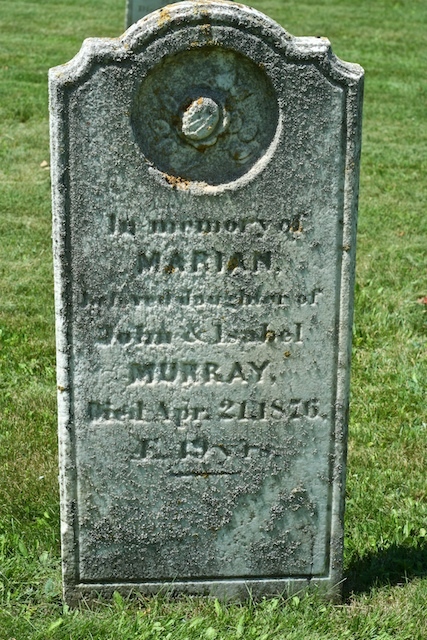 Her grandparents were John and Mary (McPhail) Murray on her father’s side. Editor’s note: Carved roses are often featured on a woman’s stone. Symbolizes love, beauty, hope and unfailing love. For a young girl, the rose may be still be a bud or at least not in full bloom to represent a life that was not fully lived. Carver’s signature on bottom left corner. More information on founding families can be found in The History and Stories of Clyde River. We are open to suggestions on how the stones can be further enhanced, protected from weather damage and preserved for future generations. 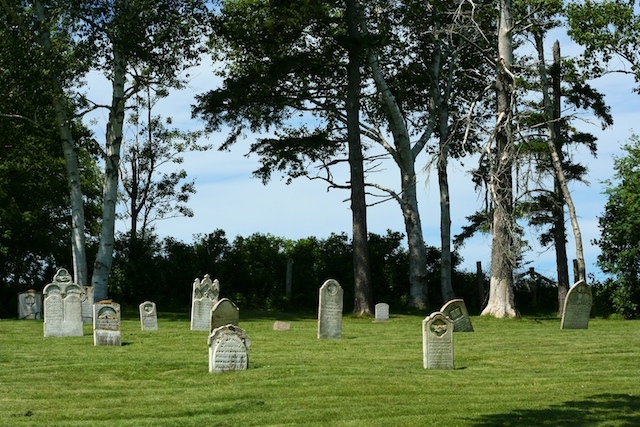 The years have taken their toll on the Pioneer Cemetery, and although the Clyde River Community Council ensures the grass is cut, resources are needed to clean and straighten these precious stones that tell the early history of this community. Ideas can be shared in the comments section below this story. 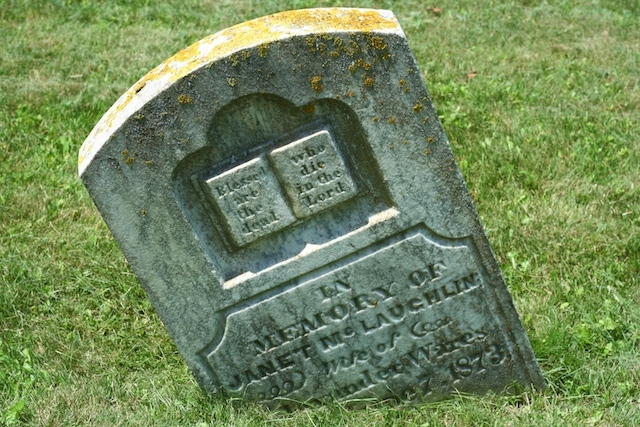 A storyboard was created which is displayed in the Clyde River Baptist Church Cemetery during the summer season. It features the inscriptions recorded in this story.